There aren’t many hotel restaurants I regularly dine at except SOCO Kitchen, its convenient downtown location and reasonable pricing has me returning. 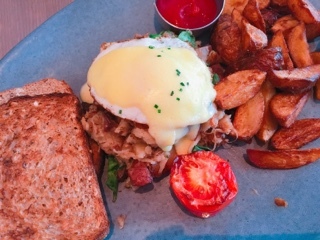 Past visits typically revolve around corporate lunches or dinner after work, but when we found ourselves hungry after a morning at Fan Expo (SOCO Kitchen is literally across the street from the Metro Convention Centre), that afternoon marked my first brunch visit. Despite it being a busy weekend with tons of tourists, it wasn’t packed at SOCO and we could walk-in and secure a table. 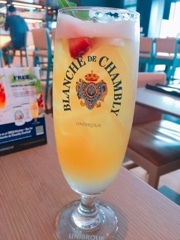 In due time, I was set up with a refreshing Blanche de Chambly strawberry and basil Collins cocktail ($8) where the light Belgian style wheat ale is mixed with gin, maple syrup, and lemon juice. While the cocktail contains a lot less fruit than in the picture, the two strawberries on top did give off a fruity aroma. SOCO’s buttermilk pancakes ($14) are fluffy while still having a cake-like quality so it’s not like eating air. 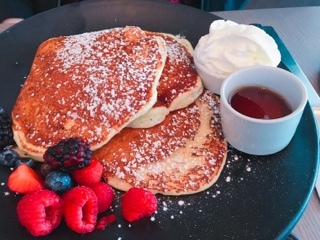 The batter has a brown butter salty flavour, so when combined with icing sugar, maple syrup, and whipped cream the pancakes don’t taste overly sweet. Overall, they’re really good pancakes, with enough flavour and well a lovely caramelized searing to the crust. 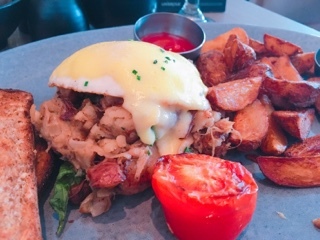 Their duck hash ($17) takes shredded duck confit and mixes it with roasted smashed potatoes to create an almost creamy savoury hash. On top, the fried egg with a touch of hollandaise makes it into an even more decadant breakfast. The dish could have benefited from more onion and bell peppers (to give the hash more texture and aesthetics) and the potatoes being cooked longer (so it develops a bit of a crust to help make the hash's components more distinct). Don’t make the same mistake as me and order the breakfast potatoes as a side (forgetting that the hash already has potatoes). Get the side salad instead, especially since the meal also comes with bread – with all the carbs in makes for an extremely filling meal – a great option for fuelling up before a big day of exploring downtown Toronto or braving the slew of crowds at Fan Expo.